My five-year-old grandson doesn’t know what they are. Actor Tom Hanks collects them. And I am so captivated by their beauty and their astounding variety that I am writing a book about them, in collaboration with Martin Howard, another well-known collector. What are they? Antique typewriters. Martin’s website conveys some of the extraordinary range in the machines created before 1900. So when Philippa and I went to Paris recently, the search for typewriter history inevitably entered the picture. For starters, I wanted to find 42, rue Vivienne. I was tracing the story of Frank Lambert of Brooklyn N.Y., formerly known as François Lambert of Lyon, France. 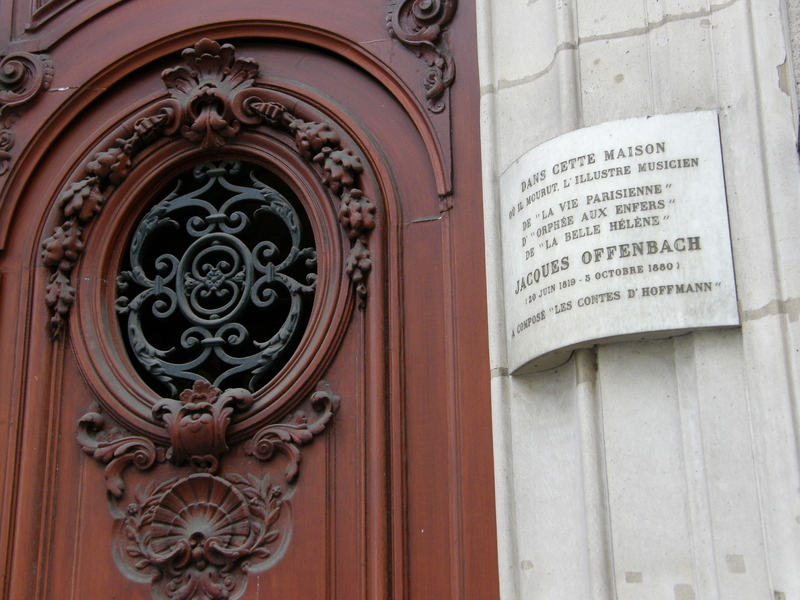 François/Frank was an inventor who made most of his money with a water meter, but later became known for the typewriter design that bears his name. It is probably my favourite of all antique typewriters. In France, the manufacture and sale of Lambert typewriters was controlled by one Sidney Hébert, who had a factory in Dieppe. 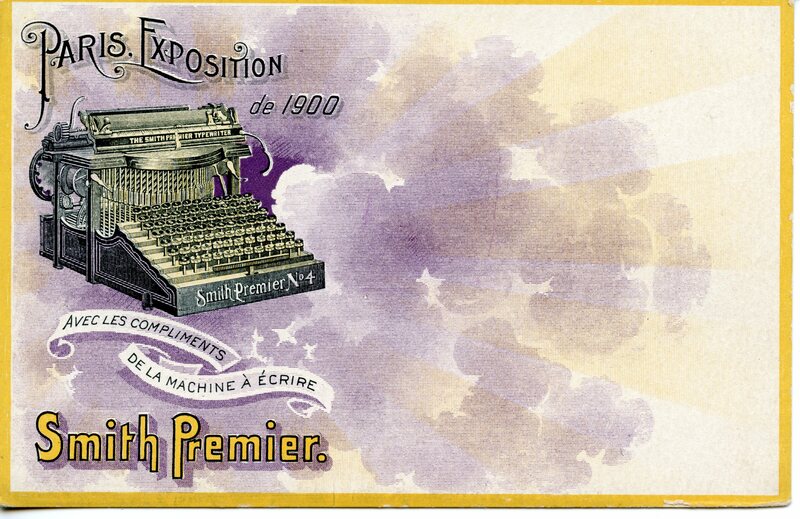 Hébert listed himself as Lambert typewriter maker “for the entire world.” His Paris address was 42, rue Vivienne. Number 42 has a central entry and two store fronts each with separate street level businesses. Each buys and sells gold ingots and coins, as do a number of other nearby businesses. Next door at 40 is the two-star Hotel Vivienne. Another port of call (pardon the pun) was the Bassin de l’Arsenal near the Place de la Bastille. Twice a year, both sides of the basin are lined with about 350 dealers in the Antiquités Brocante Bastille presented by the Joel Garcia Organisation. Among the dealers in furniture, silver, and porcelain are a few who deal in paper and postcards. I asked one dealer if he had any postcards featuring typewriters. He looked in his boxes and pulled out a handful for me to look at. This is one of the first I looked at. In addition to typewriters, the photo is about costume and social position. The wasp-waisted teacher is quite elegant, while two of the students appear to be wearing smocks over their clothes. The students are using three different kinds of equipment, and I asked three typewriter collectors if they could help me identify them. Three experts, Martin Howard, Peter Weil, and Richard Polt, agreed that the typewriter shown on the left was a Yost, Model #10. Why are there so many rows of keys? There was one set of keys for upper case and another for lower case. The woman next to the teacher is using a “court reporting stenographic machine” that Peter Weil suggested could be the French-made Stenophile. A court reporter might be expected to capture as many as 300 words per minute. The continuous paper roll meant that no time was wasted inserting new pieces of paper. 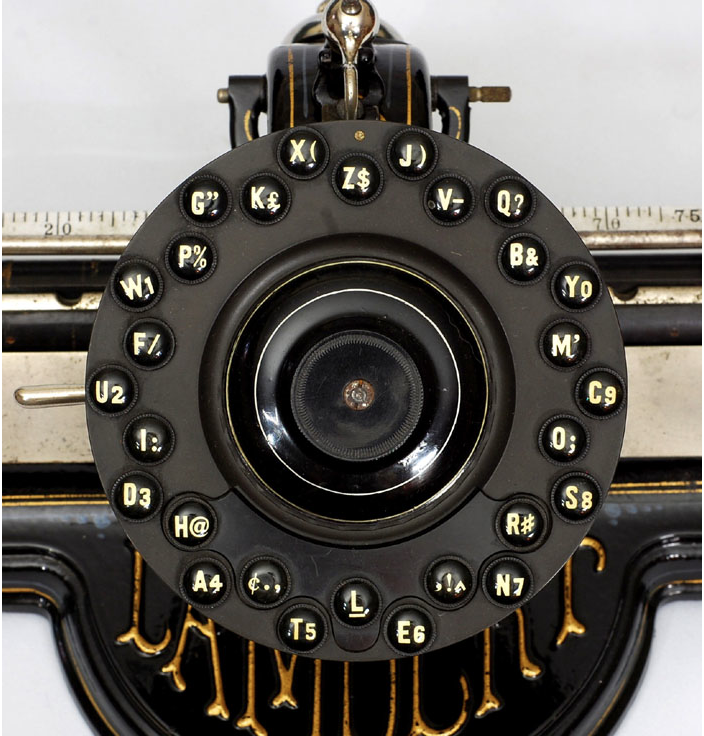 Stenographic machines had fewer keys than the conventional typewriter and rather than typing single letters consecutively one typed a number of keys at the same time to produce what, to the knowledgeable, could be interpreted as syllables, words or phrases. This method of typing is called chording and allows speeds vastly superior to a conventional typewriter if one knew the appropriate shorthand method such as Pitman. 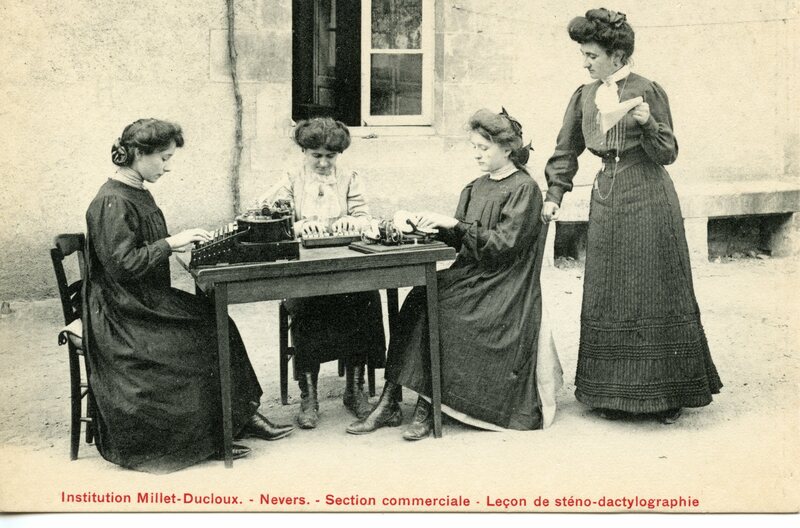 Finally, the woman in the centre is using a practice keyboard, where in addition to learning keyboard layout, one could practice smooth rhythmical typing. 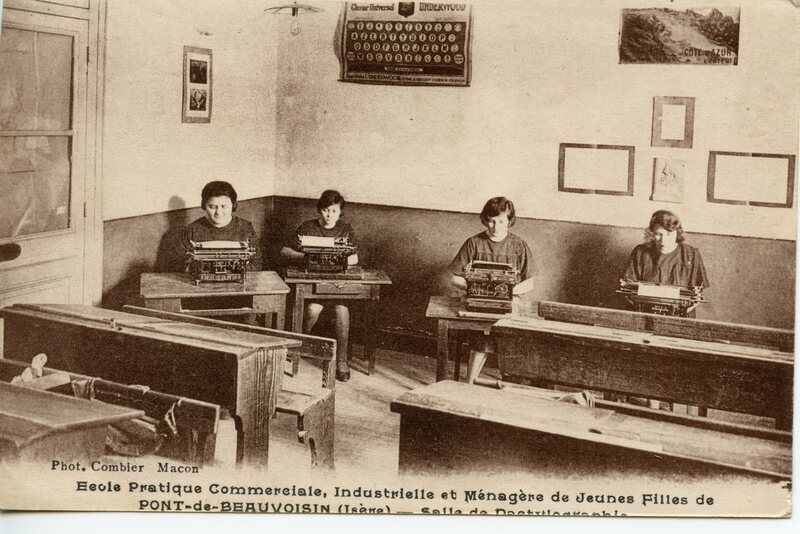 The above postcard image from the same dealer shows a typewriting class or school in Pont-de-Beauvoisin. It offers a small clue as to how postcards were produced. Postcards were printed in sheets and then cut to make individual postcards. Part of the bottom line of text is missing because the machine was either not set up properly or the sheet had not been fed in straight. Even though the tops of the letters on the bottom line are largely cut off, you can make out the words “Salle de Dactylographie” (typewriting class). It appears to be a rather spartan conventional classroom with four typewriting tables added at the back, along with the Underwood keyboard guide on the wall. Note that the keyboard guide is for the French “AZERTY” layout rather than the QWERTY. 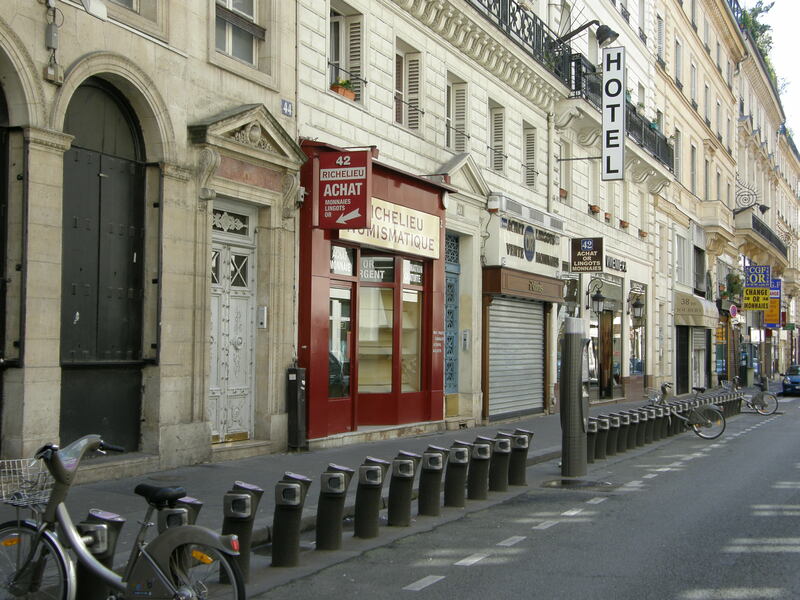 (Still a problem for English visitors to France who use Internet cafés!) Peter Weil examined the photo and concluded two of the machines were Underwoods and one was an LC Smith, probably about 1910 or later. The dealer also had some typewriter ephemera from the Paris Exposition of 1900. I love the design and the colour of this postcard. Peter later told me that the Smith Premier No. 4 had won the gold medal at the 1900 Exposition. A few days after Martin Howard saw the card, he suggested I might want the actual typewriter to go along with it. It just so happened that he had been approached by someone looking for a good home for a Smith Premier No. 4. I am now the proud owner of one of these machines. Perhaps the most unusual item I bought from the dealer at the Bastille is the image below. It invited the recipient or reader to try out the “perfected” new models for free, phone the Paris office, or visit at 8, boulevard des Capucines. But who got this invitation? The next image gives us the answer. 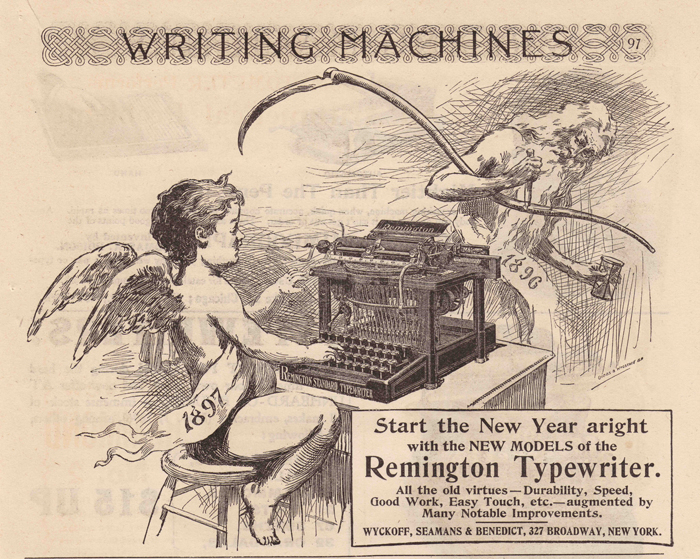 The Remington ad we looked at was on the back of a receipt, dated 1 September 1912. 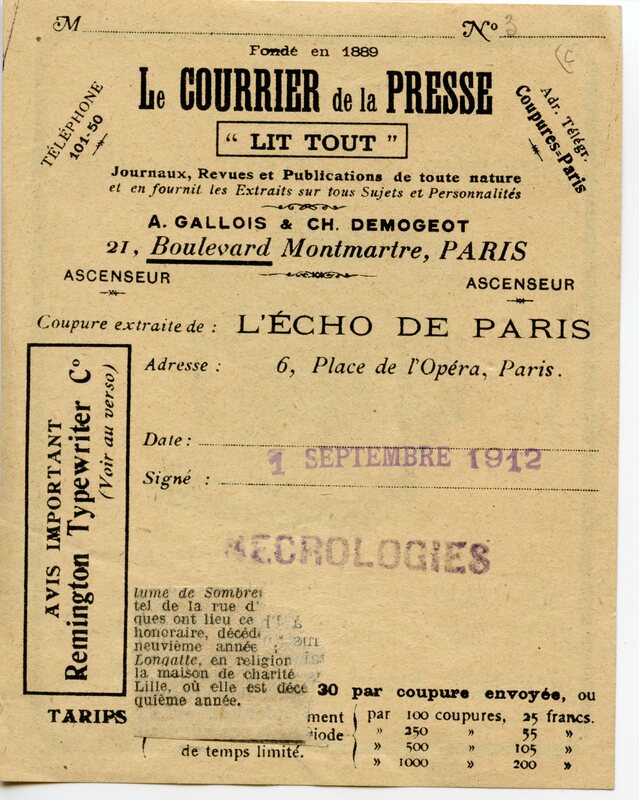 It documented payment of an announcement in the newspaper L’Écho de Paris. No ordinary announcement, an obituary. You can see a scrap of the tear-off sheet, which, Philippa discovered, refers to Comte Charles de Villelume de Sombreuil, who had died suddenly at the age of 51 in his home at Versailles a few days before. Perhaps whoever paid for the announcement took the receipt and stuffed it in a file. Perhaps he or she read the ad and marched off to 8, boulevard des Capucines and bought a typewriter. Who knows? But almost exactly 100 years later, I went to find the Remington offices myself. Early on a holiday morning I walked up to the imposing doors. Perhaps the Remington office had been on the ground floor with plate glass windows looking out onto the passing scene. Perhaps they were in one of the upper floor offices. Clearly the building was in a good area. 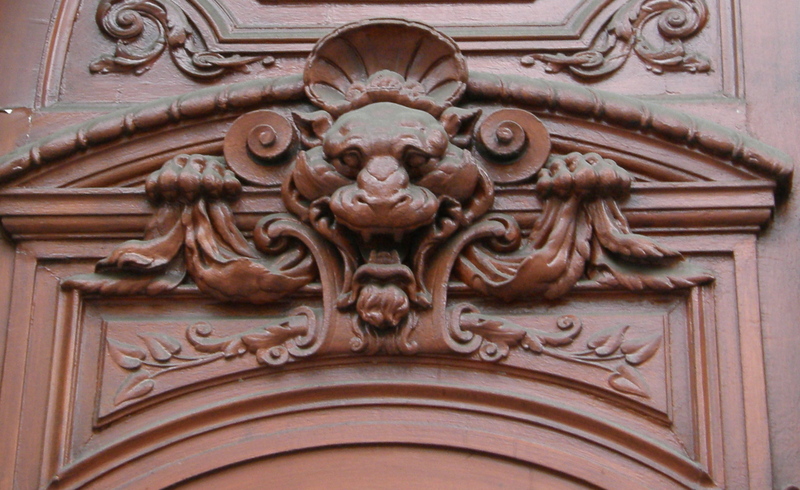 I noticed two medallions near the top of the door opening. What is Sir Thomas Gresham (1518-1579), London merchant, one-time mayor of the City of London, financial agent for Henry VIII and Queen Elizabeth I, and founder of Gresham College, doing here? Turns out that this building once housed one of the Paris offices of a British life insurance company called The Gresham. There is also a plaque beside the door. 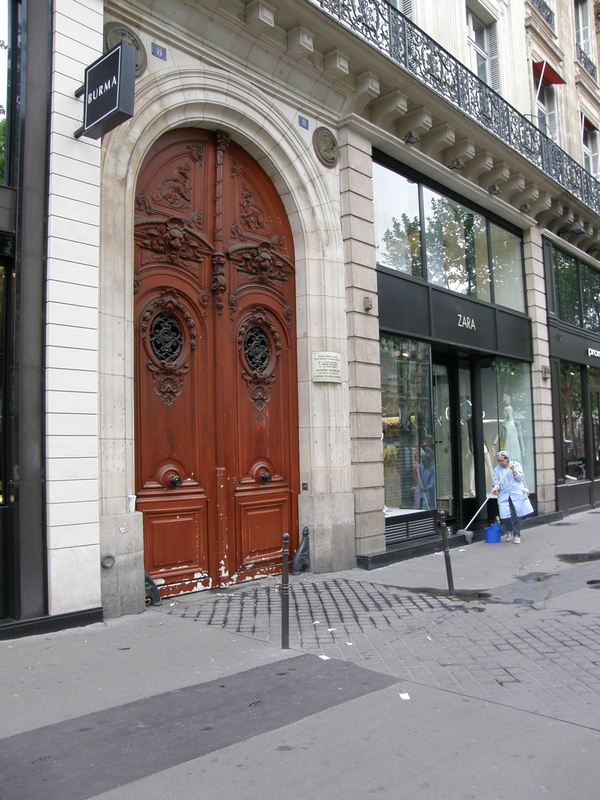 So I bid au revoir to the imposing doors and the memory of Jacques Offenbach but I will be back in search of Remington. Finally, our trip to Paris coincided with one of the great antiquarian book fairs of the world: The Paris International Antiquarian Book Fair. The event was held at the Grand Palais, built for the 1900 Paris Exposition. The setting was perfect for the displays of rare, antiquarian books and artworks. Already, we are wondering if we can attend the fair in 2013. To get a sense of both the fair and the building, click here for the Book Fair Video. The music you are hearing is from the periodic live concerts that took place throughout the fair. The selection of books, manuscripts, and art was overwhelming. After some pondering, I bought an original hand-painted piece of advertising artwork for Remington typewriters. 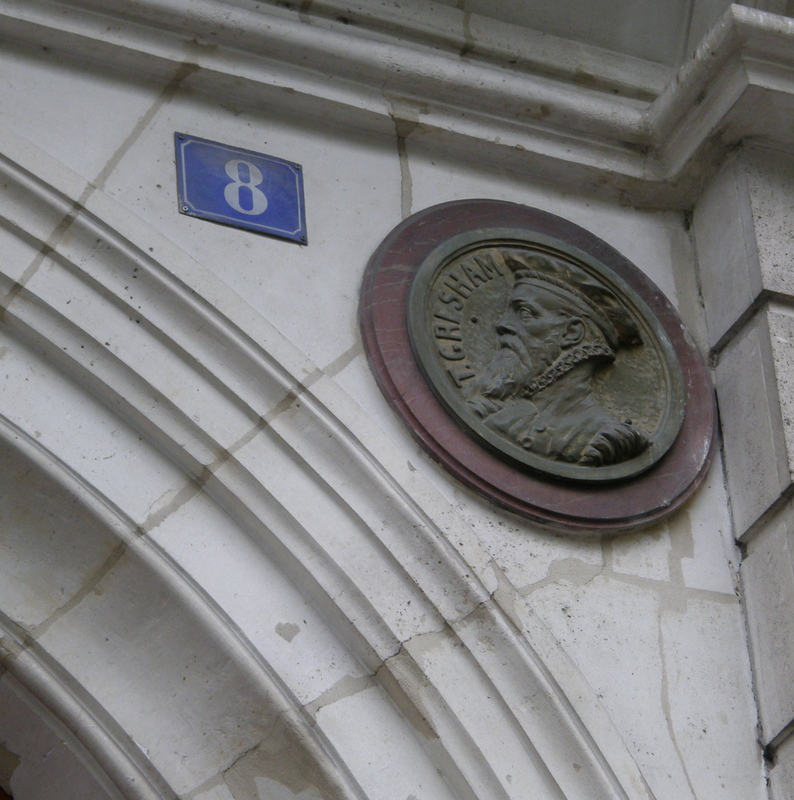 The address was familiar–8, boulevard des Capucines–and I had already been there. Elsewhere in the book fair, we could see other collectors finding their own treasures. Paris is made for people with passions who like to browse and sometimes buy. Part of the great joy of collecting is taking your interests with you wherever you go. You might be surprised by what you find. We recommend you do it in Paris. Text and photographs by Norman Ball. With special thanks to Martin Howard, Peter Weil and Richard Polt. This entry was posted in Paris expositions, Paris history, Paris postcards, Paris typewriters and tagged 8 boulevard des Capucines, antique typewriters, antiquetypewriters.com, Antiquités Brocante Bastille, Bassin de l’Arsenal, boulevard des Capucines, Comte Charles de Villelume de Sombreuil, François Lambert, Frank Lambert, Grand Palais, Gresham College, Institution Millet-Ducloux, Jacques Offenbach, Joel Garcia Organisation, Lambert typewriters, Lambert water meter, L’Écho de Paris, Martin Howard, Nevers France, Paris Book Fair, Paris Exposition 1900, Paris International Antiquarian Book Fair, Peter Weil, Place de la Bastille, Pont-de-Beauvoisin, postcards, Remington, Remington Typewriter Co., Richard Polt, rue Vivienne, Sidney Hébert, Sir Thomas Gresham, Smith Premier No. 4, Smith Premier tyepwriter, stenographic machine, Stenophile, The Gresham, Tom Hanks, typewriters, typewriting class, typewriting school, Yost typewriter. Bookmark the permalink. What a wonderful blog… loved the info on the typewriters, Norman. Made me recall the old round-shaped typewriter in the Green Gables house in Charlottetown on which LM Montgomery wrote the Anne books…. I loved my old upright Olivetti typewriter (like a 1930s M40) handed down to me from my Mother’s office. I never learned to “type” so my experience with a typewriter was pleasurable and I even made a lithograph of it on hand-made paper when I went to the Cranbrook Academy of Art. I sent a print of it to the Olivetti Company and received a nice thank you letter in return. I have always wondered what happened to it. Was it framed and hanging in someone’s office or thrown away? Your upcoming book on typewriters sounds very interesting. 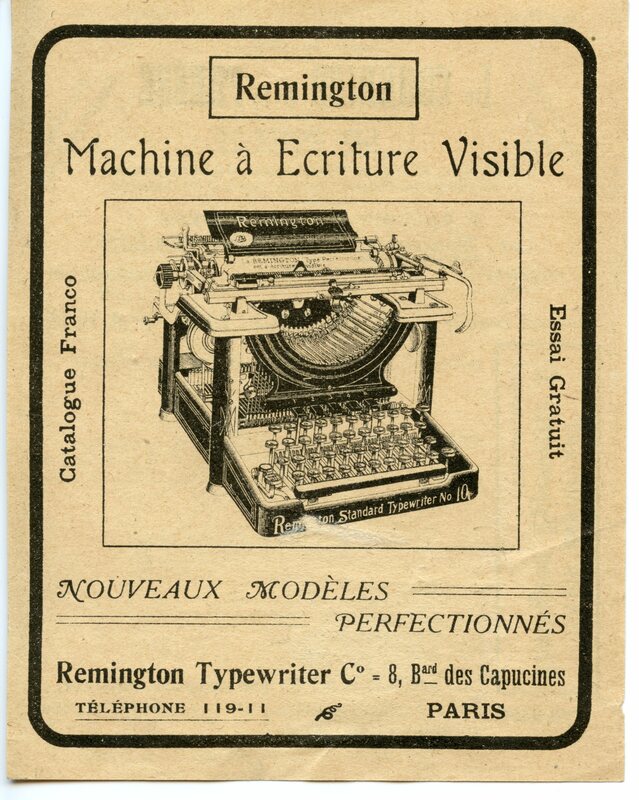 I didn’t know there was a Remington connection with Paris, but I am now all misty-eyed about typewriters! I loved the sound of a newsroom with clattering typewriters, and the way you could bash at the keys, and rip paper out of the machine when stories didn’t pan out… using a typewriter was always such a tactile experience, and each machine handled very differently. Love the serendipity here and the other lunatics who have the same passion for Paris. Merci. thanks to Martin Howard for the link to your blog! Very interested to see the Thomas Gresham link! Have just found a Lambert typewriter at a ‘vide-grenier’in South West France. What an incredible machine….. I may put it on ebay later,but for the moment will enjoy looking at it. A most fascinating exploration. Sidney Hebert is my 1st cousin 2x removed and he was born in London in 1868 to a clockmaker Onesime Hebert and his wife Gertrude Beatrice, nee Newsom. My family records originally tracked him and his parents to Dieppe and little more was known until recently when information about him branching out from being an horloger de la marine to manufacturing machines a ecrire began to emerge. His background is covered briefly in a number of French Journals especially those connected either with clockmaking or with typewriters. He married Clemence Dancet a daughter of the Mayor of Cluses, Alexis Dancet and I have as yet discovered only one child, Georges Sydney Hebert, born 1891 who was killed in 1918 in a Schneider C1 tank at Juvincourt. One record of that tragic event names his mother as Clemence “Daucet” but I am sure this is a “typo”. Sidney Hebert appears to have continued producing the “Lambert” typewriter into the 1920s but I have no knowledge of him or his family after that. I’d very much like to know more but many thanks for the original material and subsequent comments.